You know there are good waves when you see hordes of Tel Avivians heading towards the sea with their board under their arm or strategically against their bicycles. Surfers congregate on specific beaches, especially at the Hilton, Dolphinarium, and Ha’Chof Hamaravi, near Yafo. One of Tel Aviv’s top surfing schools is Topsea Surfing Center, where lessons are available for beginners and experts. Equipment can also be hired here. For those who like the salty water of the sea but prefer to do laps in a pool, the Gordon Swimming Pool offers both. Located right on the beach, its three pools are filled with ground water drawn from a depth of 150 meters. Three pools; an Olympic-sized pool for the serious swimmer and a children’s pool and toddler pool. All are emptied and refilled with fresh, clean water every night which is why the water is colder than you’d find in a regular pool. The Gordon Pool has existed since the 50’s but has since been fully refurbished and modernised. With a view to the sea, palm trees and caressed by the ocean’s breeze it’s a real pleasure. Opening hours: Sunday 1:30 to 9 P.M.; Monday-Thursday, 6 A.M. to 9 P.M.; Friday, 6 A.M. to 7 P.M.; Saturday, 7 A.M. to 6 P.M. On Fridays, the pool’s lockers close at 7:10 P.M. Entrance fees: 58 NIS for children, students and pensioners and 68 NIS for adults. For the more intrepid, there is diving in the clear waters of Tel Aviv’s shore and also off shore. It can be done independently or with instructors. Octopus Diving School is a veteran institution that has been operating for more than 25 years, offering courses for all levels, from the open water certificate to diving instructors. There’s also a dive shop selling diving equipment, which can also be hired. Dive Tel Aviv is another popular place, which offers private lessons for very small groups, from 2 to 4 persons. 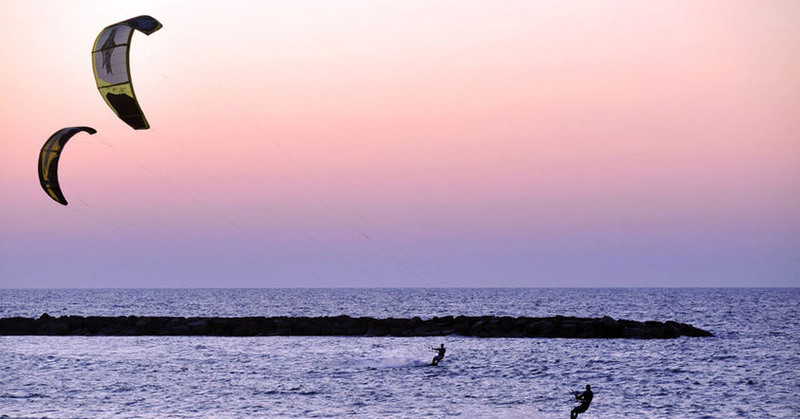 This extreme sport is very popular in Israel, and in Beit Yanai beach, 20 minutes ride from North Tel Aviv, there’s a reputable kitesurfing school, Kiteaway. Boards with sails dot the sea when it’s windy, and for those who want to give it a shot for the first time or become masters, Sea Center Tel Aviv offers courses for all levels. Less difficult but not less fun: they also have kayak courses or rental. No doubt – the most popular sport, its translation being “Stomach-Back”, which refers to sunbathing.